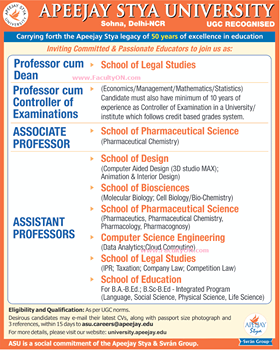 Apeejay Stya University, Delhi has advertised in THE TIMES OF INDIA newspaper for the recruitment of Professor/Associate Professor/Assistant Professor jobs vacancies. Interested and eligible job aspirants are requested to apply with in 15 days. Check out further more details below. About College: The Apeejay Stya University is a seat of global learning that offers rich opportunities for innovative teaching-learning, creativity and research across disciplines. It aims to bring about transformation of society through value-based education, man-making and nation-building, by blending together the dual identities of a technology and research based university with a liberal arts institution.